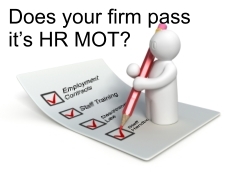 Why do I need an HR MOT? How do I introduce it to my staff? Often employees will have forgotten that you had policies and procedures in the first place. It is good practice to inform them that changes will be occurring, then to give them copies of your new staff handbook or set of procedures, giving them the chance to read them and discuss them with you. Where there is a whole sale change it is sometimes better to hold a staff meeting. We can help with this, attending with you to explain the legal changes and offsetting any staff members fears. What if the law changes again? As a Resource First Ltd client you will recieve a twice annual bulletin with details of any law changes that may affect you. This will also contain any changes to percieved best practices, information from ACAS and other bodies that may be of use and details of future law changes. Do I have to use Resource First to update my contracts if I take an HR MOT? No - we will provide you with contacts, web links and articles that could enable you to put your new staff handbook together yourself. Of course using us will save you time and we believe it would be a cost effective method of putting your contracts, staff handbook, policies and procedures together. What do I need to do during the MOT? All we ask is that you give us some of your time at the beginning of the process to colate your present contracts, policies and procedures etc and explain any specific requirements your business has, then some time at the end to talk through the report that we produce for you. If you have any questions not answered above please call us on 0845 224 0048 or send a message by email.